I am very happy to announce that in the year under review your Group has crossed the Billion Dollar PBT threshold. Even as we celebrate this landmark achievement, being true to our DNA we are already setting our sights on the next horizon. Twenty thirteen was a year ‘stirred’ by hyper activity in the political arena in T&T creating some spikes in an otherwise predictable economy. Growth in key Sectors of the Group came from the improvement in the execution of our business plans, cost management and a sharper focus on delivering on our investments. By contrast our Barbados operation continues to wrestle with the constraints imposed by macroeconomic fiscal adjustment. Despite this and the resultant drop off in demand across all sectors, a systematic approach of restructuring each organization to better align with the new market realities has improved the bottom line performance of our businesses. We remain confident and focused on initiatives to further improve efficiency and opportunities for investments in future growth. While most of our Region lies becalmed, the Guyana economy maintained modest momentum in the period and in spite of foreign exchange challenges and rising inflation our business on the South American continent delivered double digit growth for the fifth consecutive year. 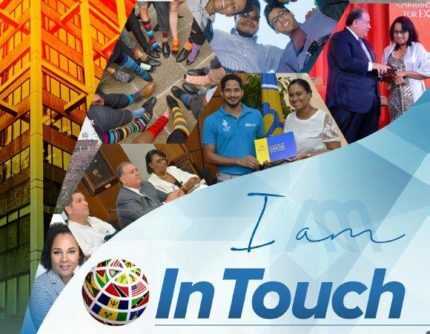 As we reflect on our success as a regional conglomerate we are also acutely aware of the economic and social challenges in our Caribbean markets as well as the growing sophistication of the competition at home and abroad. Fortunately we are also constantly restless, examining the performance in every company, of every Sector for new business opportunities, ways to improve what we do and the innovation to do it better. 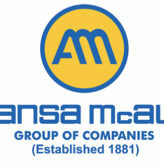 In 2013 your Group set another record in its 132rd year of operation and I would like on your behalf to thank every one of the almost six thousand members in the ANSA McAL family, from our Miami operation in the North to Guyana in the South for the effort and dedication it took to achieving this goal. This is a proud achievement for us all. Your Executive believes delivering consistent performance over the long term is key to build and maintain stakeholder confidence. I am therefore pleased to report that for the fourth consecutive year your Group has maintained a strong growth trajectory. Revenues of $6.2 billion have improved by 6% and a record PBT of $1.1billion is up on prior year by 21%. Earnings per Share (EPS) of $4.31 also improved by 17% over the previous period, total assets are now at $12.3 B from $11.3B in 2012. At the time of reporting your Group remains stronger and healthier than ever before, our robust corporate governance structure infused in every facet of operations. In 2013 debt was further reduced by 53% and our gearing ratio is at 1.9%. Cash generation from operations was $985M which represents 68% of EBITDA, our debt capacity can comfortably support the investments that will fuel the growth of the Group in the years ahead. We constantly remind ourselves that growing the skill and capacity of our people is the key to unlocking the ingenuity that will keep us ‘steps’ ahead of our competition. I am indeed proud to report, where ever we operate regardless of the challenges, our Executive and Management teams’ commitment to ‘being the best’ is relentless. In 2013 the Group committed investments in the Manufacturing, Brewing, Media and Automotive Sectors of $285M in new business projects or in areas that either increased capacity or maintained and improved plant and process efficiency. Some of these initiatives are complete and are improving our domestic and export competiveness. 2013 was an excellent year for the Automotive Sector. We saw a 20% increase in revenue and with tighter control of expenses and realignment of our human resources, delivering a 45% increase in profits. Mitsubishi retained its leadership position in the truck segment and remains committed to supporting Government trust in CNG, having delivered 190 such vehicles to state agencies. Our luxury brands also saw an increase and leadership role in this segment, which we expect will continue as new products are introduced in 2014. The sector continues to focus on enhancing customer service through skills development, master technician training, and investment in the upgrading of existing showrooms and sector wide investment in a new IT System. In 2014 the sector will open a 50,000 square feet multi brand showroom / service centre and state of the art spare parts warehouse in Chaguanas. We will also be cutting the ribbon on the new Ford building in June. 2013 was a successful year for the Sector with most brands showing good growth, further entrenching our position as market leader for beer, stouts and malts categories in the Trinidad and Tobago, Grenada and St. Kitts and Nevis markets. The Stag, Carib and Mackeson brands grew throughout CARICOM as we continue to capture market share in key regional markets. The Regional Partnership Agreement with Heineken has added this world brand to our product line and provides customers and the trade with a Premium Caribbean and International portfolio. Heineken’s industry knowhow, coupled with the Group’s marketing knowledge and insights, are proving to be a potent platform for further growth and opportunity. The investments in capacity at Carib Brewery in 2012 were timely, as we were able to capitalize on this increased volume in sales throughout the region. We expect continued growth in our brands in the local, regional and international markets as we continue to explore new market opportunities for our brands around the world. The Distribution Sector had a solid performance in 2013 achieving double digit growth over PY in Revenue and Profitability. 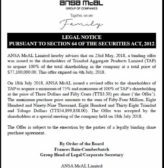 Both AMCO in Trinidad and ANSA McAL Trading in Guyana produced a high level of growth and notwithstanding the difficult economic conditions in Barbados, BrydenStokes produced a commendable result, with the Health & Wellness Division achieving budget. The first year of operation of Twee Liquor Store achieved our expectations and has been well integrated into the Sector and has proved itself to be a good showcase for our AMCO distributed brands. In 2014 we have planned a warehouse expansion in our Guyana operation which will be the 2nd expansion in three years, to cater for our continued growth and a similar expansion in our Barbados operation which will allow Bryden Stokes to operate from one location following the merger in September ’12. At AMCO, new business initiatives are planned in the Food Service and Liquor Divisions in ’14. The Sector capitalized on several opportunities and delivered a very strong performance. In all business lines namely Banking, General Insurance, Life Insurance and Mutual Funds, profits surged in the period. It is noteworthy that the financial performance was the result of increased business activity without compromise of risk acceptance and management. We have a unique combination of banking and insurance and we are confident of continued high quality progressive results. The Manufacturing Sector undertook several transformative investments in 2013 to improve its productivity and competitiveness regionally. Our Sector-wide ERP project was completed on time and on budget and our Human Resource capacity was also strengthened by the appointment of several new executives across the sector. A major achievement, for the Sector, was the start-up of our $400 million investment in the clay block plant. ANSA Coatings had its most successful year following the integration of two manufacturing plants into one facility. Trinidad Match, the oldest company in the Sector, also continues to perform commendably, achieving its best efficiency in the last five years. ANSA Chemicals plant expansion project was completed in Q1 2013. At ANSA Polymer, the investment in state of the art PET equipment and will allow customers access to a wider range of quality packaging solutions. Consistent with the Group’s overall vision, we have made an investment of $0.5 billion in this sector, leaving it well positioned to exploit market opportunities and service its customers today and well into the future. Retail: Standard Distributors T&T, Barbados and Bell Furniture Ltd as a group delivered one of the best years on record to mark the first full year as part of our Group. Revenues improved by 17% on prior year. At Standard the infusion of a young IT savvy executive management team has accelerated the pace of change in key areas of the operation clearing the path for closer contact with next generation of customers via the social media channel. Standard Barbados has a new CEO and is now benefiting from synergies in procurement and marketing and is improving performance in spite of a challenging economy. Bell has been reorganised to improve production efficiency and quality and remains very competitive in the local & regional markets. Services: Although the Sector grew Revenue by 10% over prior year, performance was not consistent across the sector. Our purchasing/logistics operation in the US grew by 11% and in spite of a tough economy in Barbados our Brydens Xpress & Retail business performed marginally better than 2012. However, MBM and ANSA Tech had significant changes in org structure and the implementation of the new ERP IT system that surfaced challenges that impacted their performance. These have all been addressed and the companies are geared to deliver budget performance in 2014. The outlook for the sector is positive and plans for expansion into complementary service businesses are under review. Consistent with the ANSA McAL aspiration of value creation for all stakeholders I am pleased to report that shareholders will again benefit from the ‘consistent improved performance’ that I referred to earlier. Your Directors have accordingly declared a dividend of $1.30 which reflects an improvement of 19% over 2012. 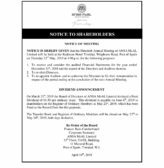 In order to share the celebration of hitting the ‘Billion $ Mark’ with you, your Executive has decided that our 2013 Annual General Meeting will be an event worthy of this success and of your loyalty and commitment as investors. This year, as part of our Annual Meeting of Shareholders, we will stage a Group Expo specifically with you in mind. This event will take place on Saturday 5th July 2014 at the Hyatt Regency Trinidad from 10.00 a.m. The exhibition will demonstrate to you our Shareholder, how we are investing your money to deliver maximum returns.You will get the opportunity to have direct interface with your Executives, Managers and Staff Members, ask questions and hear first-hand about future plans, products & services. We are pleased to invite you to attend our AGM/Expo and take advantage of deals and discounts designed exclusively for you on the day. The ANSA McAL Group has long held the view that business has an opportunity and obligation to improve the lives of nationals of a country and to serve the greater good. We believe that economic prosperity is a pre-condition for community well-being and a sustainable society. This philosophy which is well ingrained throughout the Group, has influenced how we invest in our business and employees and the type of support we give to our communities in the spheres of culture, sport, education and the arts. We are committed to responsible citizenship that includes the health and safety of our staff, the well-being of our communities where we serve, a healthy and sustainable environment, the economic value we create and maintaining stringent corporate governance rules to protect our shareholders’ investment. The Group continues to take particular pride in the sponsorship of the Anthony N. Sabga Caribbean Awards for Excellence which started in 2006. Every year, prizes valued at (TT) 1.5 million are awarded to Laureates in Arts & Letters, Science & Technology and Public & Civic Contributions. To date, we have contributed over 10 million dollars towards the Foundation and recognized over 18 Caricom Nationals of Trinidad & Tobago, Dominica, St Vincent & the Grenadines, Barbados, Grenada, St Kitts & Nevis and St Lucia. We will continue to embrace our corporate responsibilities with our people and stakeholders. The ‘billion dollar’ landmark achievement of the Group in 2013 and the success of the individual companies is a reflection of the talent, strength and resilience of the people in your Group that delivered this result. 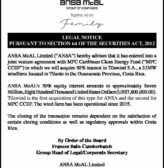 This is a validation our corporate mantra that, ANSA McAL is . . . the place for performers. During the year under review, I am pleased to report that Dr Hamid Ghany joined Guardian Media Ltd (GML) as Managing Editor/Deputy Managing Director. Mr Grenfill Kissoon was appointed a Non-Executive Chairman of the Board of Directors of GML. Mr Kissoon replaced Mr Dennis Gurley who retired from the Board after 11 years of service. I would like to place on record our sincere gratitude to Mr Gurley for his sterling contribution to our Media – Group. In our Automotive Sector, Mr David Sabga took the helm as Sector Head whilst Mr Ray A. Sumairsingh was appointed as Executive Director at ANSA McAL Ltd.
Mr Chip Sa Gomes was promoted to Sector Head, Financial Services and Mr Gregory Hill was appointed as the new Managing Director of ANSA Merchant Bank Ltd. Additionally, Mr Aneal Maharaj relinquished the post of Sector Head Retail to concentrate on his substantive post of Group Finance Director. After improving competitiveness and circulation of our print media and growing CNC3 to the number one TV station, Mr David G. Inglefield relinquished the post as the Media Sector Head and assumed the role of Chairman of Standard Distributors in the Retail Sector. Congratulations are in order for Mr Gerry Brooks, our Chief Operating Officer and Mrs Anna Maria Garcia-Brooks, Non-Executive Director CNC3, for being named as Distinguished Alumni from the University of the West Indies. Once again I would like to record the immense pride I feel, particularly at this time, to lead our Group made up of some of the best and brightest people in the business community today. As I review what must be one of the most diverse groups in the Caribbean today it reinforces my belief in our business model and corporate governance structure. In spite of the uncertainty generated by the need to adjust the economic and social order in our region, I see opportunity for growth and expansion in every sector of your Group. I also feel the energy of our people and the momentum generated by our successes. I sense an eagerness to reach even further, to create even greater value in the years ahead. In closing, let me also take this opportunity to thank our Parent Board members, the non-executive members that serve on our subsidiary boards, as well as my Executive Team for their support and dedication to our shared goals and for the achievements in 2013.